Those don’t look that great – generally, white chocolate from Hershey’s isn’t that good – do they even use real cocoa butter? I haven’t tried the strawberry ones yet. They do have raspberry chocolate ones that are pretty awesome! I just got the Espresso ones and the Macadamia Nut ones. Both with Special Dark Chocolate. The Espresso was way too coffee tasting. But I am really not a huge coffee fan and the Macadamia Nut ones weren’t overly sweet but they were good. 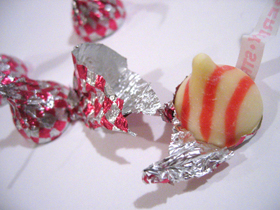 There are also new Carmel Creme ones too… Would love to know your take on those! @Chloe: Ohhhh, Caramel Creme? I need to find those! Where have you seen them? I’ve never tried the Strawberry Creme ones, but the Dark Chocolate with Rasberry Kisses are disgusting!!! I just saw the add for strawberry kisses, so I’m off to the store to get some. I will give send a review after tasting them. I hope they are as good as the candy cane kisses. Sadly, I have just now got my hands on them. I love them, but then again I’m more of a white chocolate lover than milk or dark. (sorry to admit) I love them! I think they taste like strawberry milk if you let them melt in your mouth. 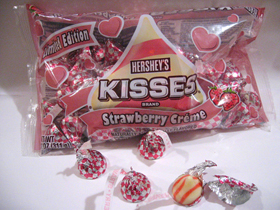 i LOVE LOVE LOVE the strawberry creme kisses. Do they still have them cuz i NEED to buy some!